"Family can't always fix a difficult situation, and everybody makes mistakes. We shouldn't expect perfect. But we can hope that the people we love love us enough to try to make it right." Miranda Kenneally has truly become one of my go-to authors for sweet contemporary stories. Whenever I need a break from devouring fantasy stories, I always turn to her books. Her first book, Catching Jordan while not a favorite of mine, had interesting characters that intrigued me. The kind of light, easy-read story that it was, lead me to read the next book, and the next book, the book after that and so on. And while each book introduces different sets of characters, seeing that it happens at the same environment, plus finding them connected with each other in some way, was fascinating. Jesse's Girl is probably the lightest story of all the Hundred Oaks books to date for me. It doesn't have as much drama as the others and yet still remains an enjoyable book to read. I guess it's because Maya reminded me so much about myself when I was her age. I was too insecure and too intimidated to do something I had always dreamed of wanting to do. I felt I wasn't good enough for it to happen. But you know what they say about dreams.. If it doesn't scare you, it's not big enough. So watching her chase after it made me really happy for her. The love story was already set in the beginning, you already know they're going to end up together. And to be honest, there isn't much to say about it. It was cute, but not the kind that will leave me in a puddle of goo for giggling and fan girling too much. What I appreciate most about this story is how it showed the importance of family, in all forms (you'll get what I mean once you read it). And of course, following your dreams. Jesse's Girl is a feel good, minimal drama story that will make any dreamer want to pursue their goals even more. 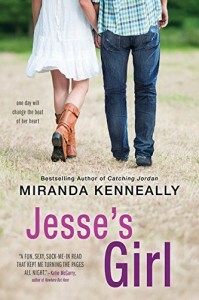 *Thank you, Sourcebooks Fire, and NetGalley for granting my request to view Jesse's Girl. Romeo and Juliet, and Hamlet mash up! If you've read [or know of] these Shakespeare stories, you know they end in tragedy. As most of his plays do I suppose. Anyway, get ready to see a whole new twist to these stories. Such Sweet Sorrow is one of those books that reel you in with such a great and unique idea for a story. So I didn't find it surprising that I took it upon myself to request for a copy on Netgalley. While Shakespeare's plays came off gloomy and well, tragically, Jenny Trout take on them was lighter and rather spunky. I didn't really find the original Hamlet to be a likable protagonist but, Ms. Trout's version of him was one I prefer. A teen rightful king Hamlet with a cheerful personality, although impulsive most of the time, was definitely an interesting take. Romeo and Juliet were also interesting characters. They're still hopelessly in love but I really appreciated how their characters grew throughout the book. [This may be a bit spoiler-ish]. From an ever so serious and blood thirsty Romeo, in the end we find a more mature and light hearted man. And from a damsel in distress, Juliet turned into someone who need not be saved. The lore of this book was impressive. I loved the idea that there can be multiple dimensions in the afterlife much like how people of different cultures view them. Now while characters and lore are swell and all, I still have a few issues with the book. My problem with Such Sweet Sorrow would probably be the journey through the underworld. I like seeing the different dimensions, but the journey was a bit too long for me, or maybe the narratives of the characters' thoughts were getting in the way. Also, I find the creatures descriptions a bit vague, it's either the descriptions weren't vivid enough or I wasn't in an imaginative mood to visualize them properly. I did love the idea that although this book didn't turn out a tragedy like the plays it was inspired of, it's not a definite happily ever after either. Overall, Such Sweet Sorrow was an enjoyable read. It had all the elements I was looking for in a story: a great adventure, action packed fight scenes, and a terrific reimagining of the classics. *Thank you, Entangled Teen and NetGalley for granting my request to view Such Sweet Sorrow. "It seems to me, that no matter what we do, no matter what choices we make, there isn't a happy ending waiting at the end of the long road... But that doesn't mean we give up. It doesn't mean we stop fighting"
So much death! It hurts! Danielle L. Jensen has baffled me once again! She came out strong with debuting Stolen Songbird last year and here she is again keeping readers hanging at the edge of their seats with Hidden Huntress. Following shortly with the events that ended in Stolen Songbird, Hidden Huntress opens up to a whole new adventure for Cecile. Cecile was a strong character during the first book, but I have to admit that book two gave me a different perspective on her personality. It may not have been a pleasing one, but it was understandable considering her situation. I can't blame her that desperation and longing might have tipped her off balance. Tristan remains to be the ever heroic prince that he is. While circumstances from book one gained him more enemies than before, he redeems himself otherwise. Plot-wise, Hidden Huntress is a solid and well developed story. You may make presumptions and guesses with the events that follow, but you'll never be truly sure what happens next. Ms. Jensen's writing makes it so that the story remains intriguing and unpredictable each step of the way. The pacing is much faster than its predecessor, although still keeps readers well informed. Be warned though, expect it to be a bit on the slow side. But do not fret, the story flows smoothly and progresses well albeit slowly, and I promise you the patience you draw out will be worth it in the end. I really enjoyed reading Hidden Huntress and it pains me that I have to wait until next year for book three, although I shouldn't be surprised. Stupid sequels! I hate you! Okay I take that back, I love sequels, but the waiting just kills me! 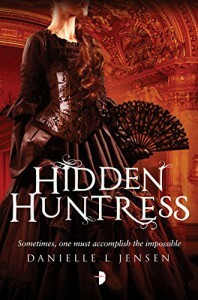 *Thank you, Angry Robot Books and NetGalley for granting my request to view Hidden Huntress. This would actually be the first time I witnessed a book meet its hype and book comparisons. When the blurb mentioned that this was for fans of Cassie Clare’s City of Bones and Laini Taylor’s Daughter of Smoke and Bone, it truly was fitting. Hooray! To be honest, I kind of thought this was another overrated, hyped up debut novel. I’ve been lucking out since last year with debut novels that sadly do not meet my expectations, so I was really happy to find my experience with this book take a different turn. 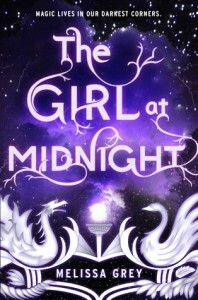 The Girl at Midnight has an impressive set of characters and POVs – not to mention an interesting mix of species, [way to go creative, Ms. Grey!] – that would keep readers turning page after page after page. I’m quite surprised to find that although we have a witty, snarky female protagonist in Echo, we have with us a not so brooding, non-enigmatic love interest, Caius, who also happens to show a fairly humorous side. Normally when we have an amusing female, the male comes off the mysterious, serious type. I say, “yay!” to that change! The plot does not fail either, this was way more adventurous than I expected. Readers will find themselves immersed in a unique and well thought of storyline, filled with funny banters, intense escapes and bold discoveries. It’s not the type of book that you’d make predictions ahead and they turn out exactly the way you thought. Although you might come close, The Girl at Midnight has its fair share of twists and surprises that would leave you impressed. This is an exciting new series to watch out for! Kudos, Melissa Grey! *Thank you, Random House Children's, Delacorte Press and NetGalley for granting my request to view The Girl at Midnight. I think majority of those who’ve been anticipating This Shattered World were readers who have been hooked over Tarver and Lilac’s story in These Broken Stars, hoping to see more of these two lovable characters take on a new adventure. Boy, were we all crushed to find out that there are new sets of characters taking hold of the second book! But that feeling of disappointment was short-lived. Once readers have gotten to know Jubilee and Flynn, you get to fall in love with them just as well. True, they’re not Tarver and Lilac, but they come off just as memorable and worth rooting for all the same. Now, like me, you probably felt cheated that Tarver and Lilac aren’t our main heroes in this book. Do not fret! Tarver makes a very significant appearance, Lilac as well, although a rather shorter one. The big difference with These Broken Stars and This Shattered World would probably be their story’s direction. With These Broken Stars, I was so engrossed with the love story of Tarver and Lilac, while This Shattered World made me focus on the world and mystery encased within. Sure there are sweet moments for Jubilee and Flynn but their love story did take a bit of a step back. 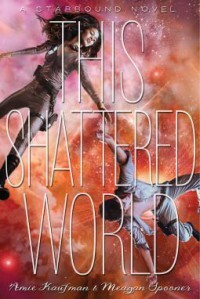 While These Broken Stars made me feel mostly giddy and swoony, This Shattered World offered a more action-packed, heart-stopping story that I think would make any fan of the first book find it satisfying and enjoyable. You’ll find this book as compelling and just as original as the first. I’m really eager to see where the Starbound trilogy’s story would go to next. The plot’s progression is precisely laid out in a way that eases readers into it in a steady and comprehensible approach. Book three could not come any sooner! Becoming Jinn by its cover doesn’t scream much attention, although the simplicity of the design tells a lot with just that one silver bracelet. The summary on the other hand, gives off a very interesting story to look forward to. The book itself? A very long introduction. Becoming Jinn tells the story of Azra, a genie-in-training who wishes nothing more than to be a normal person, and by person I mean human. But no one can escape the life of a Jinn. Azra is a very likable character. Her compassion for the people she loves is commendable. But her impulsiveness makes her all the more relatable. While I love a good introductory narrative, I find this a little too uneventful and way too much explanatory. It was informative at its best since it gives answers to the most drilling questions about its lore you could think of, but it would have been nice to be balanced with a more definite dilemma at hand, and a more heart stopping situation for our heroine, since most of it was just wrapped up in the mystery of the Jinn world. I can’t say that nothing really happened either, although it wasn’t as thrilling as I expected, the story did move forward and it progressed to events leading to deeper questioning of Azra’s Jinn ancestry. With my experience, Becoming Jinn feels like a series that will be providing its readers with an invigorating storyline. The background story alone is already gripping and worth knowing. In spite of it being on the slow side, I am still looking forward to reading more of this Jinn world, and see its potential to grow. 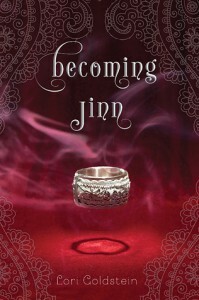 *Thank you, Macmillan, Feiwel and Friends, and NetGalley for granting my request to view Becoming Jinn. Courage can be displayed in many forms, my lord… Sometimes it’s evident in the knight charging forward with the lance on his steed. But perhaps it can also take the form of a head bowed before the enemy. It’s a fairy tale. What more could I ask for? As much as I appreciate author’s reimagining my favorite classical fairy tales, it’s refreshing to see original writings just as well. Lately though, I find myself reading so-so stories in the category. So how lovely was it to find this book? An Uncertain Choice was one huge surprise for me. It was one of those books I least expected to be as good as it was. Set in the medieval times, Lady Rosemarie’s story of faith and finding true love was well worth the time reading. Although I have to admit that it was quite predictable, the author’s writing style enabled me to enjoy the tale in spite of already knowing who’s who and what’s what. There is something about her writing that made this simple story an absolute page-turner. Filled with every cliché one reader might think of: a beautiful princess, a knight in shining armor, a deceiving villain lurking on the side, An Uncertain Choice is every bit the fairy tale one might find simply blah. But Jody Hedlund sure knows how to write an invigorating story, and an original fairy tale at that! 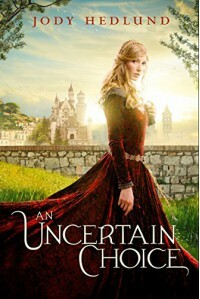 *Thank you, Zonderkids and NetGalley for granting my request to view An Uncertain Choice. I feel the need to give this book a standing ovation after I finished it. It was just so darn sweet! Now when I glanced upon the name “Aurora” I immediately thought this would be a retelling of Sleeping Beauty. And I oh, so love retellings, don’t I? So yes, I must read Princess of Thorns!!! But Stacey Jay had other plans. While this book did involve Sleeping Beauty, it wasn’t exactly a retelling. This story involved Sleeping Beauty’s children rather than herself. And although this is a fairy tale, might I warn you that even though Sleeping Beauty met her prince, it didn’t turn out exactly a happily ever after. Not that I’m such a party pooper, but it’s kind of nice to see a fairy tale that showed an unhappy ending for the princess. Change is good sometimes, right? I also appreciated that this book was focused on more than one fairy tale. It was fascinating to see how well the author was able to merge the two stories in one. Cleverly done, my friend. I absolutely enjoyed the flow of the story of Princess of Thorns. World building and characterization was splendid and ingenious. I like the disguise Aurora dawned, very creative on developing the romance between our protagonists; Plus points on the fact that they started off as friends and not the insta-love sort. I’ve only read one of Stacey Jay’s books which is Juliet Immortal, and I was really pleased with it that I had to get a copy of the second book, Romeo Redeemed, which I am embarrassed to say has been sitting on my shelf for over 2 years now. I’m sorry, I had a TBR pile that I was hoping to trim down but apparently never could, and Romeo Redeemed was piled there. I really like how Stacey Jay tells her stories. They are very fairy tale-like and imaginative, and you’ll never guess how it would end. 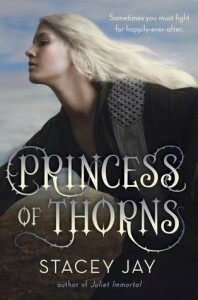 Having read Princess of Thorns makes me even more determined to get to read her other books. *Thank you, Random House and NetGalley for granting my request to view Princess of Thorns. Seeker is one of those books that grip you in on the very first chapter. It has a very intriguing opening and quite an action packed beginning. 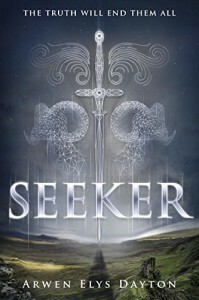 With an interesting mystery you’d want to see unravel, and a unique set of characters, the first few chapters of Seeker make you feel like there is going to be one hell of story to watch out for. Sadly, it felt short of what I felt it could offer. Seeker lacked a more elaborate history on what this world was really about. The mystery of the story was too vague and did not untangle enough into that of which a reader, such as myself, would be satisfied with. I would have wanted to see how the Seekers were before they became tainted. I wanted to get to know each house that existed beforehand. Instead, I was left with a narrow descriptive that it just so happened over time. The characters were another problem I had with this book. While I found them to be unique at first, they turned out confusing to me throughout the story. Quin is a typical YA protagonist, badass and all that; Shinobu didn’t seem to be such a significant character up until the middle of the book; John, I don’t understand. He’s a villain and a good guy all in one, is that it? Even after his motives were revealed, I still didn’t get his decisions. Briac would have made an incredibly spiteful villain, but alas, he was told to be gruesome but not shown enough in a way that would make me despise him so bad that I couldn’t wait for him to die. And Master Tan just happened to be there at the right place, at the right time? That was too convenient. I also didn’t understand the purpose of the athame. It didn’t seem to be incredibly relevant, sure it has the power to let a person travel from one place to another in the blink of an eye, but I don’t see how that should have affected the decisions the characters made in their lives. Although I fail to see the riveting story in Seeker, I can’t deny that it has a huge amount of potential to become an incredibly ground breaking series. I think it just needs a little more detail to its world. It turned out more of a chase, and an abruptly blooming love story than anything else. I would have enjoyed this a lot more if I saw a more progressive storyline. *Thank you, Random House and NetGalley for granting my request to view Seeker. You know you’ve read a really good book when you start comparing it to other books with the same genre. 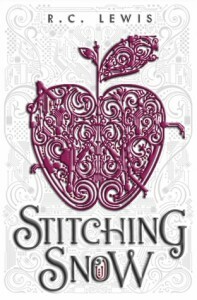 Stitching Snow had a very similar vibe to Marissa Meyer’s The Lunar Chronicles: the sci-fi feel and fairy tale reimagining. It was no wonder that I was drawn to Stitching Snow. But how far did it go to impress a fairy tale retelling junkie like me? Essie and Dane were characters I find likable, but I have to admit there’s not much to go on from there, other than their hidden identities. When all that is revealed, I felt like they didn’t come out as strong and as memorable characters that I was hoping them to be. They’re not the kind of characters that would be the first ones to come to mind when a random question about book characters would come about. Nevertheless, for Stitching Snow, they are the kind of characters you would appreciate reading about. While the title “Stitching Snow” was first a mystery to me, finding out why was a fascinating spin. Although I felt that the numerous “stitching” parts were a little too time consuming, it was balanced out with the right amount of action packed and romantic scenes throughout Essie and Dane’s journey. Stitching Snow is more likely a lighter take on the science fiction slash fairy tale reimagining mix. It may not be as epic as Cinder and the rest of the Lunar Chronicles books, but it is a good addition into the genre. Also, I’m happy to see that this wasn’t a series, not that it doesn’t deserve such, nor would I say no to another book, but the story was already as good as it could get. I really appreciated the kind of closure readers of this book were given. *Thank you, Disney-Hyperion for granting my request to view Stitching Snow. I wasn’t a big fan of the first book from this series, Scorched. But I always saw the plot as something intriguing. Even though the book didn’t meet my expectations, I was hoping to see it improve with the next books to come. So in spite of my uncertainties, I thought to give Shattered a try. Shattered started off with a rather confusing prologue. It made me wonder, “Did I mistake this sequel for another book?” Always the impatient reader that I am, I suppose I should have waited until I reached the first chapter. What? I couldn’t help but react too soon! 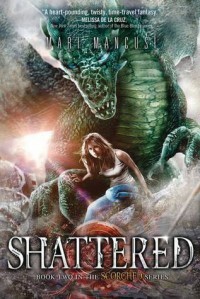 I was glad to see that Shattered turned out way more eventful than Scorched. I had complained before that Scorched had an inconsistent pacing. Shattered on the other hand, showed off an exciting flow to the story. I don’t think I felt improvement character-wise though. Trinity is struggling but she has that ever-determined persona that she always had going for her since book one. Caleb was turning into a weary yet redeemable character. Connor’s still self-righteous. He was boring to begin with in my opinion and I don’t find him any more interesting with this book. The addition of Scarlet as a character first felt like it was unnecessary, then upon the Caleb-encounter, it felt like a consolation prize for him since he felt like being singled out by Trinity and Connor. Finally by the end I see the purpose behind the emergence of her character. I’m beginning to understand Emmy a lot more now. I perceived her as simply a newborn dragon. I didn’t see it in a way that I could look at her as a growing teenager as well. Still, she felt way more human than dragon to me that way so I’m still skeptical. The ending of Shattered was an unexpected turn out for something I thought to be more of a love story than anything else. Although I may have gripes with this book, I can’t deny that I’m excited to see how this would continue on. I’m still hoping for more improvements though, but overall this was a quick and momentous read. Welcome back to the world where a once great tale of a stubborn pirate, Ananna, and her assassin, Naji, came about. An adventure filled with wonders and dangers of a world so vast and breathtaking for two unlikely allies, who eventually turned into star crossed lovers; a story that had fan girls like me swooning and sighing over a simple, sweet ending. Now, enter this world again to meet a new protagonist, Hanna, a simple apprentice to a secretive said-to-be fisherman. She gets a taste of an adventure she didn’t sign up for, with a mysterious boy trying to help her out, and with danger lurking in air, and eventually… NOTHING HAPPENS. I know. It was kind of annoying to reach the end of the book, and yet I have learned nothing of what was going on other than the basics. The reason I picked this book up was because I adored Cassandra Rose Clarke’s The Assassin’s Curse and The Pirate’s Wish. Seeing that it was such a lovely story, I thought The Wizard’s Promise would bring about just as an exciting tale as those two. Damn, was I so wrong! So maybe some would say I’m exaggerating over how uneventful this book was, so let me elaborate. It isn’t that nothing really went on or that the story didn’t flow out, it was just a tedious narrative with nothing IMPORTANT going on. Major parts of the book focused on the mundane life of Hanna, who I find to be such an annoying protagonist. Prepare to watch her fishing and using her magic to cast the winds; being angry at her mentor, and this mysterious non-human boy; complaining and wanting to go home; being furious over being taken away from home when she said she wanted an adventure like Ananna’s; and see the Mist come threaten and put people around her at harms way and eventually leave her alone again until they feel like they want to do it again. Then we go back to fishing! OMG! I get it! She’s a fisherman… err, woman. Whatever. Get on with it already! After The Assassin’s Curse and The Pirate’s Wish, I expected to see a story just as adventurous, if not more, with The Wizard’s Promise. I didn’t expect to watch a protagonist spend months on the sea and in a foreign territory with one or two disasters happen then eventually end up with nothing. So I don’t think I will be reading the next installment. 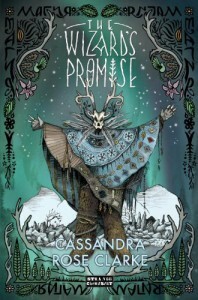 *Thank you, Strange Chemistry and Netgalley for granting my request to view The Wizard's Promise. 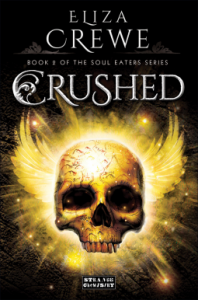 Eliza Crewe’s Crushed is just as easy to read as the first book, Cracked, from The Soul Eaters Series. While most books have a mushy tandem of a boy and a girl working side by side against all odds, we have Meda with an unlikely ally going all homicidal, and being every bit of a monster she thought she ought to be. Although it seemed disturbing, I may have grasped and understood the idea that Meda’s has tendencies of morbid satisfactions, but finding myself enthralled over her schemes… what the heck does that say about me?! I really appreciated the kind of friendship Meda and Jo have in this book, in spite of the fact that they started off differently during the beginning of the series. I was about to be pissed at Jo for all the times she didn’t take Meda’s side during conflicting moments, then BOOM! It’s enriching and inspiring to see how far a friend would go to save the other. Crushed still had it’s fair share of predictability, the betrayal brought about in the story wasn’t exactly surprising. But it plays well with the idea that although it was suspected, I was still kind of hoping it didn’t go that far. Still, the web of events that conveyed after was absolutely exciting. I can’t really say that this second installment was better than its predecessor, but I admit it did shake up the story to more comprehensive plotline. It is safe to say that readers will be up for more surprises during the next installment. *Thank you, Angry Robot and Netgalley for granting my request to view Crushed. I do believe there is no heart out there that Tarver Merendsen cannot melt into a puddle of goo with the story brought by These Broken Stars. This book has defied every thought I conjured up at every step of the way. First, on the Icarus, a Titanic-like tragedy occurs, I thought it ought to be just another tragic love story. And then comes the crash to an unknown planet. Another moment I thought it might turn out to be another survival of the fittest situation, and yet it was more than that. Tarver and Lilac’s character’s were very well established and come with definitive backgrounds that solidify their qualities. It also makes for a more empathic approach once readers get to see changes in them during the time spent on the mysterious planet after the crash. There are but a few authors who are capable of writing alternating points-of-view that a reader can truly tell apart the characters’ personality and voices. I’ve read some that make them sound so much alike, and trying hard to make them seem like they are just coincidentally thinking of the same things. I don’t think I need to point out how beautifully crafted the world – err, universe rather – that These Broken Stars has been written in. While there may be techie, sci-fi terms and descriptions thrown here and there, it was not a struggle to play with imagination. 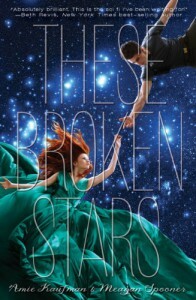 These Broken Stars is a stellar book written by a very imaginative duo, Amie Kaufman and Meagan Spooner. I love the originality of the story. I love the voices of the characters. I was engrossed with the mystery encased into the story. And I love the idea that just when I thought things were as it is – bam! I’m hit with another fascinating plot twist. If I didn’t look incredibly ridiculous doing a standing ovation in my room alone (or in a random public place) while looking at this book, I’d do it. But instead, I’ll settle with it just happening in my head. My mind has definitely been blown! I am one to never pass up a chance to read a fairy tale retelling. So it comes to no surprise that I just had to read The Stepsister’s Tale. A Cinderella story told in the eyes of the “wicked” stepsister? This should be interesting. The Stepsister’s Tale indeed have quite an intriguing opening; how expectations of high society could push a person to deceive and live in denial. Jane was a receptive character, it’s not hard to feel compassion for someone who refuses to stick to what is expected of her or what society dictates, and choose to do what it takes to take care of her family. I wouldn’t say the same for Jane’s younger sister, Maude, and her mother though. They felt a bit insignificant unless needed, but I can see that there really isn’t much for their characters to do in the story. Cinderella – or rather, Isabella in this book – was such a spoiled brat! I’ve always come to love and pity our little heroine in the other stories but I had a sudden change of heart with this one. Goodness! I don’t think I have the patience to watch children such as her. While I find the beginning of the book to my liking, I felt a little skeptical with the middle of the book. It seemed to have gone through a redundant strain of events with not much excitement. Although I understand the need to show the harshness of Jane and her family’s situation, I have to admit it was kind of boring. I like the interesting twist to the classic fairy tale. I also highly appreciate the fact that another person was set to be the villain in the story – that was new! However, I feel like it was a little short on closure over some details. For one, whatever happened to the King’s lands? Given the scarcity of food for the village where Jane and her family lived, did the people get the chance to thrive again? What of the fairies rumored to be hiding in the woods? Did they truly exist or was that simply a figment of the imagination? Although I must say I am happy over how Jane’s story has ended, there were several parts left unrequited, which I would have respected a lot more if given some conclusive answers. 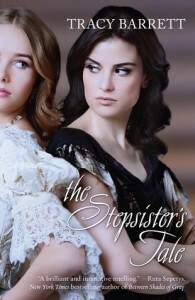 *Thank you, Harlequin Teen and Netgalley for granting my request to view The Stepsister’s Tale. I’ve come to love Ann Aguirre’s storytelling and writing style through the Razorland trilogy. I loved the character building she has done with Deuce and Fade, and her world building skills were vivid and captivating. That was enough to convince me to watch out for her next books, and that is how I came to read Mortal Danger. 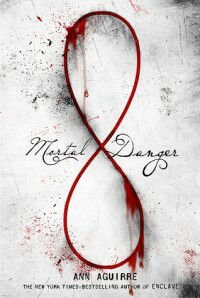 Mortal Danger is a paranormal romance mixing in the creepy urban legends that we might have heard at some extent, like Father Frost, Bloody Mary, etc. I made a mistake of reading this book in the middle of the night. I didn’t know there was an upcoming “Bloody Mary” scene, so it’s no surprise I had to stop reading after that part. It wasn’t that big of a deal, but I easily scare so I had to find some random funny comic strip online just to get it off my mind. Damn! These things really should come with a warning! While I don’t mind cliché’s in books since some authors can actually pull it off and lead it to be something a reader can appreciate and indulge in, this one was a miss. The instant romance between the protagonists, Kian and Edie, was not convincing. The villains, the plot, and all the drama weren’t any better either. I felt like everything was too strained. It also felt like I was being forced to like Edie with all that was happening in her life. Mortal Danger is definitely not a Razorland-kind of story. I truly do love Ann Aguirre’s writing, and the amount of research this story went through was impeccable, but alas, story and character wise, it didn’t impress me. It was obviously interesting given that I stuck through the entire book, but it just didn’t have the kind of spark I’m looking for in a book. I didn’t take the story at heart. *Thank you Macmillam, Feiwel & Friend, and NetGalley for granting my request to view Mortal Danger.